But now for the big boy, American Sniper. For starters, if you saw it, no, your imagination is NOT playing tricks on you: it was “CRAZY PACKED,” because it opened to HUGE January numbers. 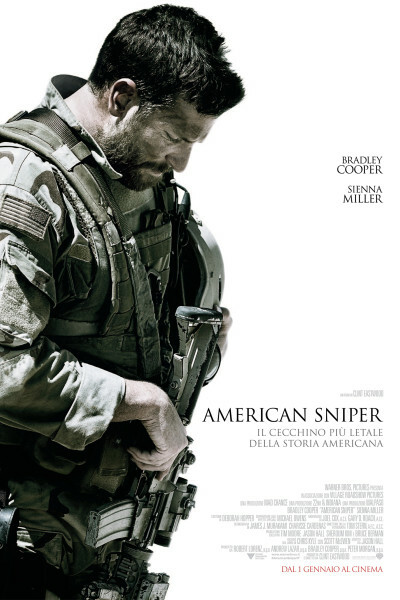 Having played only in limited release since Christmas Day, American Sniper opened nationwide this past weekend and grossed $90.2 million in three days, setting two box office records along the way: (1) It had the largest January opening in cinematic history, besting 2014’s “Ride Along” (starring Ice Cube and Kevin Hart) by a whopping $58 million dollars. (2) It is the second highest R-rated opening ever, second only to The Matrix Reloaded's $91.7 million. (Interestingly, Bradley Cooper also starred in the third largest R-rated movie ever, “The Hangover Part II,” which grossed $85.7 million in 2011.) American Sniper received the coveted ‘A+’ Cinemascore, which conceivably bodes well for its six Oscar nominations. I enjoyed the film—if “enjoy” is the correct verb—experiencing it with 26 “Movie Men.” The word each of us used most frequently as we shuffled out of the theater was “sobering.” Save a few gunshots and explosions here and there, I found it to be a very quiet film. There is much on the screen, sure, but more of the action occurs within one’s heart. If you search for its soundtrack on iTunes, you won’t find one...because there isn’t one. There are only three songs attributed to the film (“Taya’s Theme,” “Someone Like You,” and “The Funeral.”) It’s THAT quiet. I suppose they’d prefer we defend God and Country with butter knives or shoehorns or not at all. Or that we, fighting that shadowy terrorism for which we never asked, simply abide hijacked planes flying into our buildings or stand by silently while disenfranchised punks with guns shoot cartoonists in one of the most pacifistic countries in the world, the land of baguettes, croissants and crepes. Je crois que non. And for those who lambast snipers as “cowards,” as some have done in the media recently, all I can say is they are living in fantasyland. The English were routed in our American Revolution because colonists employed tiny militia who, for primarily utilitarian reasons, incorporated guerilla tactics rather than presenting nice, clean lines of infantrymen to be shot down easy as tin ducks at the state fair. Such military adaption is as old as time itself, and snipers have always been and will always be a core force multiplier in wartime. To cede high and superior vantage points, whether through aircraft or rooftops, is suicide. End of politics, end of manners, end of story. As for the film itself, it’s simple and pure and entirely unornamented, as are all Eastwood’s sparse creations, from “Unforgiven” to “Gran Torino.” In this case, it’s a man and his long rifle, representing in their simplicity the entire sweep and zeitgeist of our 14-year war-on-every-front thus far. My takeaway? We are damned if we do and damned if we don’t. There is no winning if we continue, but there is surely failure if we stop. In a world-sized playground in which bullies keep on comin’, what choice remains but to stand one’s ground? Better to die defending oneself than to forfeit freedom by allowing radicals to run the asylum unchecked. But imagine plunging one’s fist into a bucket of water. There’s spillage, there’s a wet hand, and as soon as it’s removed, the water returns—save a tad less water now—to much of its original form and state and shape. Such is the case here, it seems: as Bradley Cooper’s SEAL sniper Chris Kyle eliminates 160-255 targets [actual figures remain murky] and kicks down door after door after door, deployment after deployment, tour after tour, the emotional and traumatic spillage is everywhere, and no one’s hands are dry. There will be blood, indeed. And eventually, Kyle makes the very logical decision to fight for his wife, for his children, for the vets who battle an equally real enemy back home in every form imaginable: mental, physical, spiritual. As with “Foxcatcher,” we know how Sniper ends, too, but that doesn’t make it any easier to bear. Kyle’s casket, glistening in gold with an estimated thirteen dozen tridents, is but the umpteenth reminder the high price of war. As has been described by all, yes, the film ends in utter silence. At this point, really, there is nothing more to convey anyway. A life is gone, more will follow, damned if we do, damned if we don’t. As for Cooper himself, he faces stiff competition for the Oscar on February 22nd. In a field that includes Steve Carell, Benedict Cumberbatch, Michael Keaton and Eddie Redmayne, there isn’t one weak performance in the lot. Keaton is the shiny frontrunner, Cooper’s role will likely divide voters right down the middle, Redmayne’s Hawking is seamless, and Cumberbatch’s Turing may be too obscure for some, so it’s a complex race any way you slice it. I suspect Keaton will win (the Academy is lapping up Iñárritu’s longshots like sweet milk), and Cooper is phenomenal, but I’d personally like to see Carell’s portrayal of John E. Du Pont take the prize. He’s ceaselessly flawless and haunting in ways only partially seen among his peer group here. Musical accompaniment is, for me, immeasurably potent at creating layers and dimensionality, at creating emotion and movement in an otherwise line-free scene. Powerful as it was, I can only imagine how powerful Kyle’s funeral scene(s) would have been had Sigur Ros’s Jonsi scored them, or Michael Mann’s team (think “The Insider” or “Manhunter” or “Last of the Mohicans”). Had Mann scored the film, for example, and accompanied the funeral procession with Taps, and rolled the credits silently afterward, wow. There DEFINITELY would NOT have been a dry eye in the house, I gua-ran-tee. As it is, as his procession and burial occur, we only get one scant line of text which conveys that Chris Kyle was killed while trying to help troubled Iraqi veteran Eddie Ray Routh. No larger account, no further contextualization, no grander perspective beyond what we’ve just witnessed for, sure, two hours. And I’m fine with that; this was Kyle’s story, not some attempt to cleanly encapsulate the entirety of war. But yes, I do wish we could have gotten four or five black screens about his life, his death, his family, his fallen brethren, our progress or lack thereof and our current state of affairs over there, and a suitable tribute to his legacy today, which is vast. It is a haunting and beautiful and stripped down film, and I hope that Eastwood and Cooper continue to be acknowledged for their efforts in what is undoubtedly politically-charged subject matter, as they have proficiently created a lasting and impactful tribute—memorializing for all time one man’s sacrifice, the greatest there is, for the country he loved so dearly, so actively, so passionately, so firmly, so unquestionably, so continually. May he, and eventually each of us, rest in peace.